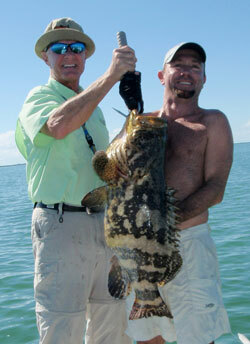 I fished a gorgeous day in Flamingo with anglers Gordy Johnson and Eugene Enlow recently. We eased up to a twin-engine plane wreck in the middle of the bay using the electric trolling motor. The plane was supposedly a drug runner that had been forced down by the DEA pilots one night in the late 80’s. It’s broken up now, but the wings and both engines are intact. On some days it holds fish and can be very productive. I pitched a live pilchard next to it and handed the rod to Eugene. He hooked a goliath grouper immediately. It pulled like a freight train and despite his best efforts, the fish got into the wreck. We could feel it struggling on the end of the line, so I knew it was still hooked and had not broken off. I wanted that fish! I told Eugene to hold the line firmly, but not too tightly. Luckily it was a calm, windless day so we stayed over the wreck and fish. I took off my sunglasses, shirt, shoes and hat. Gordy and Eugene looked at me as if I had lost my mind! 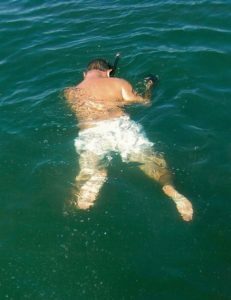 I said “I’m gonna at least TRY to get this fish.” I put on a mask and gloves and eased myself into the water. The water was crystal clear. (If it had been the least bit murky, I’d have never gone in it. Flamingo is loaded with big bull sharks) I swam down to the wreck and I creeped up on it. The line was going right to one of the big airplane engines. 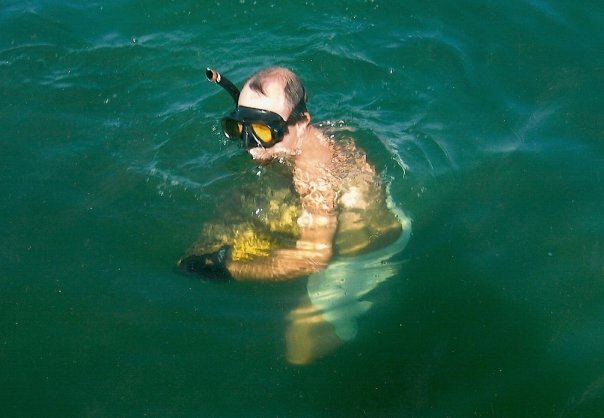 I peered into a space underneath it and did not see the grouper. I looked around the other side and there it was! It had gotten the leader wrapped around the propeller. It was all lit up and its colors were radiant. That’s a sign that a fish is agitated or angry. This occurs with many species of fish and anglers often call it “striped up”. I snuck around the backside of the big engine and grabbed the grouper by its bottom lip. It stared shaking and flapping violently. It was all I could do to hold on. I bear hugged him, pushed off of the bottom with my feet, snapped the leader and brought it up to the surface. When I put my head out of the water, Eugene said, “Oh man, that’s too bad! 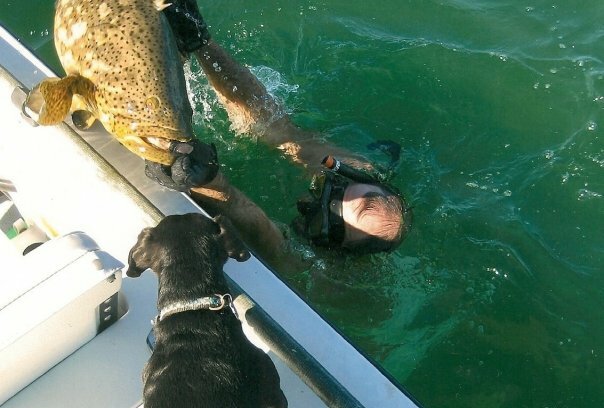 It got off!” What a kick they got when I held up the grouper! Both of them were hooting and hollering and exclaiming that they had never seen anything like it. They couldn’t wait to tell the story to their friends back at the resort where they were staying! The fish was released unharmed after some good photos. When I took off my gloves, I saw that the grouper had left me a little parting gift to remember it by. Its teeth had penetrated my right glove and chomped my thumb. I’d have to say that I think it was worth it.